Apple is planning to cease its Photo Print Products service at the end of September, as spotted by 9to5Mac. The feature let users order albums, photo books, prints, and other items featuring pictures stored in Photos (and previously iPhoto). 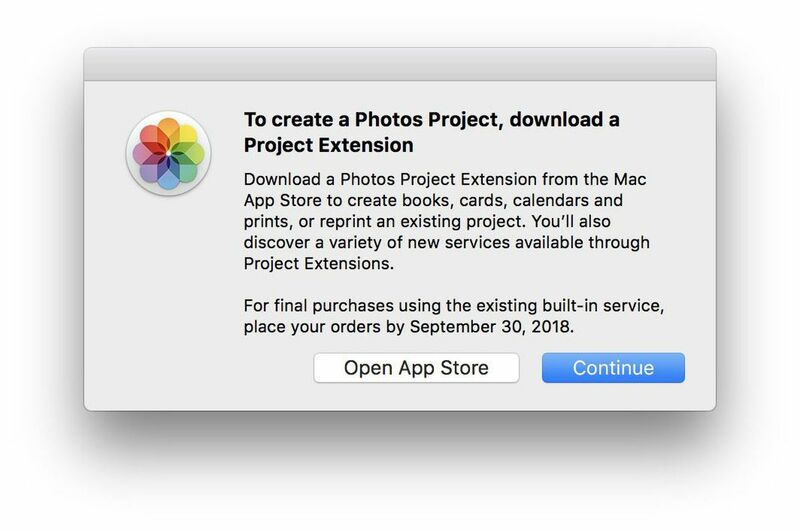 Final print orders must be placed by September 30th, 2018, according to a new pop-up message that appears in Photos when running macOS 10.13.6. The message suggests that users download a third-party app from the Mac App Store to get prints. These apps integrate directly into Photos and handle everything Apple once did. I’m kind of surprised that Apple is getting out of print making, only because it seems like it might have been a source of at least a little revenue. But maybe the hassle wasn’t worth it, especially when it’s so easy to port the job over to other developers. Apple’s printing service has been around for at least a decade, and similar features are common in most photo apps. Google Photos, Flickr, and others offer easy, in-app ways to create physical photo memorabilia. So yes, there are plenty of opportunities to get your digital photos made into physical objects, but Apple is no longer interested in doing it. RIP.